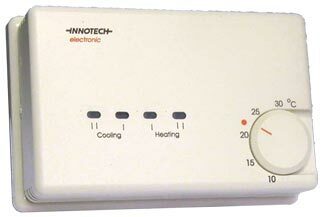 The Innotech IWP range of controllers is designed to regulate the staging of heating and cooling of air conditioning systems. The controllers can be used as stand alone devices or the modulating outputs can be used to control auxiliary units, such as chilled water valves or damper actuators. 2 stage cool controller designed to regulate the staging of heating and cooling of air conditioning systems. 1 stage heat and 1 stage cool controller designed to regulate the staging of heating and cooling of air conditioning systems. 1 stage heat controller designed to regulate the staging of heating and cooling of air conditioning systems. 2 stage heat and 2 stage cool controller designed to regulate the staging of heating and cooling of air conditioning systems. 2 stage heat controller designed to regulate the staging of heating and cooling of air conditioning systems.